Fantasy fills one with wonder. Naples is waking up to spring weather, and the desire for Paradise Coast color is reflected in our latest catch. 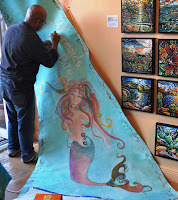 Moises Pereira has created a new mermaid sail sunshade for our gallery window and a Fantasy Fish series, too. Moises, who grew up in Venezuela, painted in Spain, Madrid, the Caribbean Islands, and Miami before settling in Naples 12 years ago. He shares a vision of Southwest Florida supported by many residents and visitors to the Paradise Coast, and his work graces the interiors of some of Naples' finest homes. Night Birds - click here. 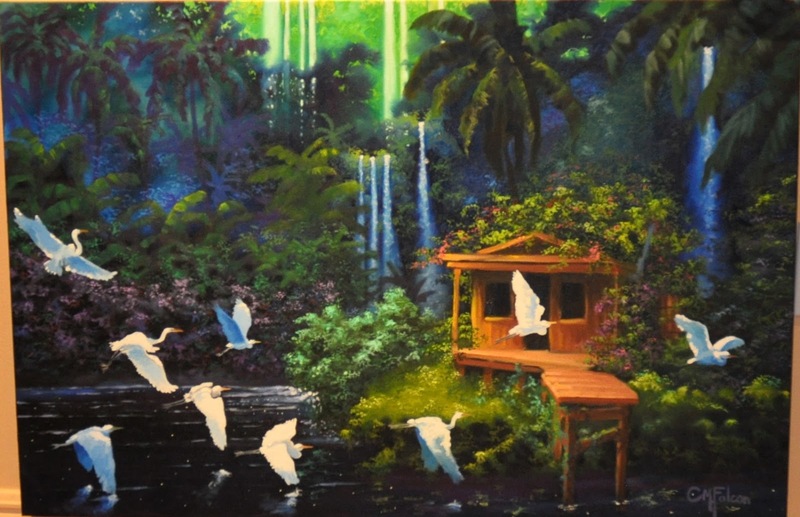 Our dear friend and prolific artist, Carlos Falcon, has painted several new pieces this season, as well, with the latest depicting surreal night scenes of the Caribbean. His captivating scenes transport the viewer to a more tranquil space, full of vibrant floral color and invigorating waterfalls. Each time he paints a new paradise at Mermaid's Bite, clients gather to sing a chorus of "I want to live there!" 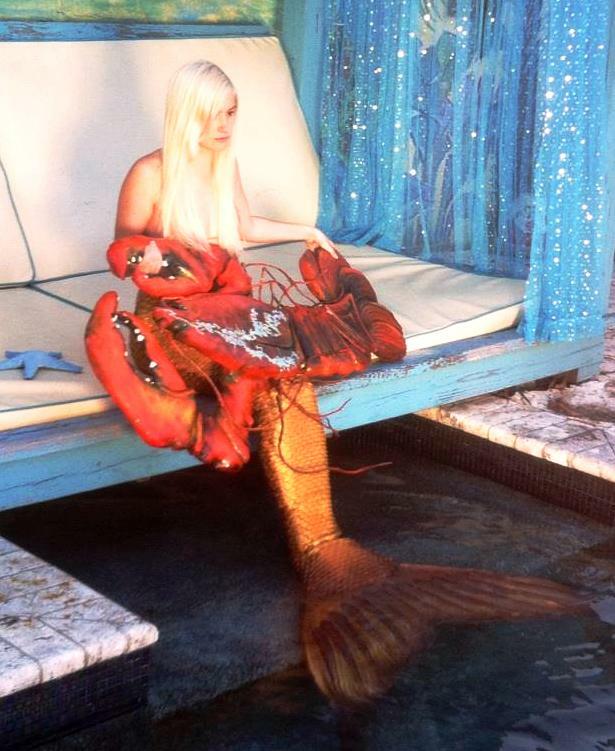 Ronni's Lobster models with a mermaid. Gatherings happen spontaneously during the Season in Naples, and 5th Avenue is especially busy this year. During the lull between lunch and dinner earlier this week, Mindy and Ronni Reasonover filled our space with flora and creatures of the sea. An enchanting handcarved lobster is resting in the shop before moving on to a client's lanai. Come and visit Ronni's Tarpon, too, who is creating quite a lot of interest in his foster home. 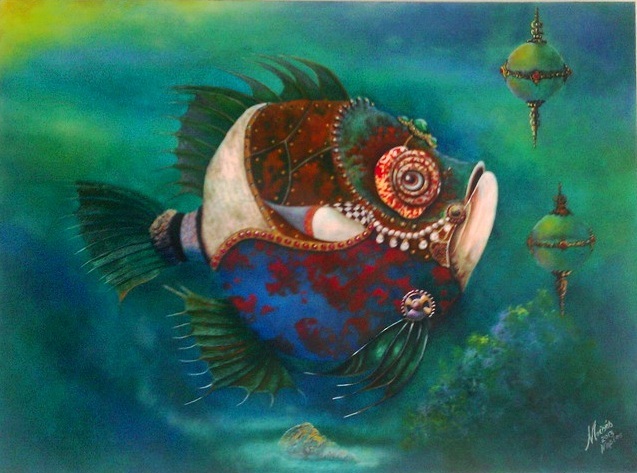 He is looking for a forever home in a sports fishing man cave, or perhaps a mermaid's lair. 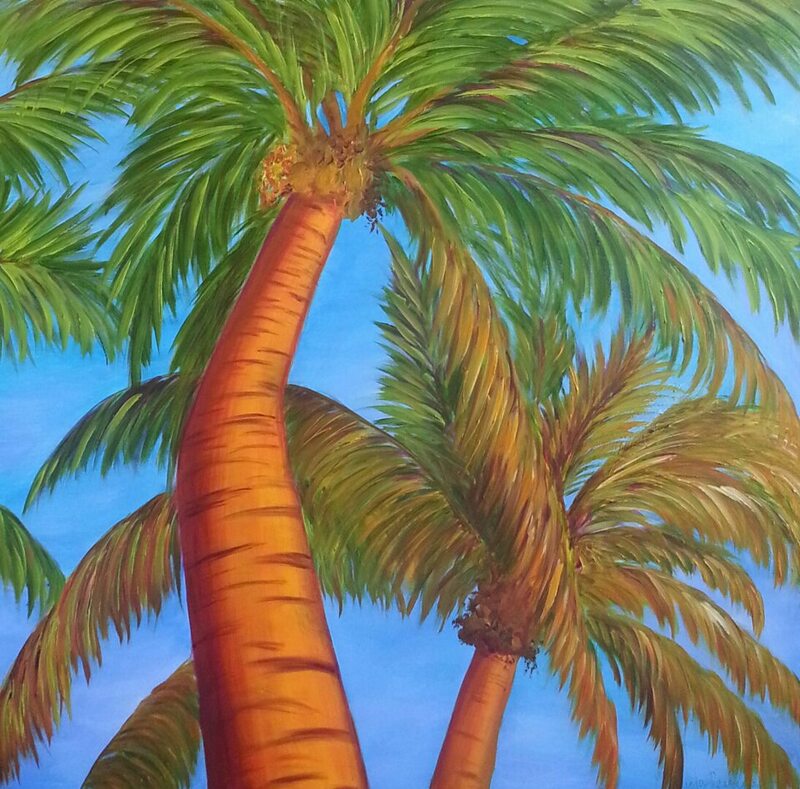 Mindy's decorator originals say paradise. Mindy's newest lush oil paintings portray the blush of Florida spring, with fresh bamboo, orchids, palms and coconuts. These bold decorator pieces impart an unique sense of warmth and luxury to collectors' homes that speaks to Naples' chic coastal lifestyle. Each spring, we are reminded of the beauty of our connection with one another and our world, especially while sitting seaside. If you are visiting Naples, or live here, join us for a taste of spirited art, then pad down to the beach and say a little prayer of gratitude. Be blessed!